Acclaimed for the scholarship of its prominent authors and the clarity of its narrative, AMERICAN GOVERNMENT: INSTITUTIONS AND POLICIES sets the standard for public policy coverage while maintaining focus on three fundamental topics: the institutions of American government; the historical development of governmental procedures, actors, and policies; and who governs in the United States and to what ends. Reader involvement in the material is bolstered by features such as learning objectives, "Who Governs?" and "To What Ends?" questions framing each chapter, and "How Things Work" boxes that illustrate important concepts. Available separately, a state-of-the-art media package with new online tools makes the learning experience engaging and accessible. "I immensely like the writing style and level; it reads like a story, exactly what will keep my students engaged." "I am very pleased with the quality of the scholarship, writing style, clarity and analysis exhibited by the work of Drs. Wilson, DiIulio, and Bose. I am also pleased with the manner in which the publisher has packaged and presented the textbook and the ancillary materials. This is as solid and intellectually honest a textbook as one could hope for. It should be the standard by which all others are measured. The emphasis on students using their critical thinking skills to reach conclusions on issues of the day provides a firm foundation for their future growth as citizens of this country. In conclusion, I think that this is the finest American Government textbook available today. 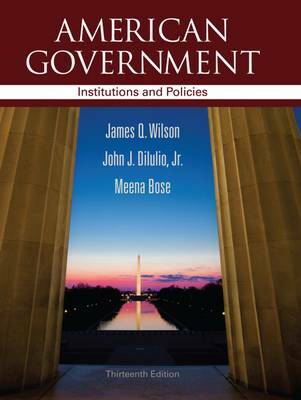 The authors combine excellent scholarship, academic rigor, practical examples and insights which makes this text an invaluable aid to any student trying to understand their government."